This product requires the base game Killing Floor. The Nightfall Character Pack adds 4 more new and unique playable characters for Killing Floor as Downloadable Content. Once you have bought the pack, they will become selectable in the character selection screen in-game. Horzine pays the bills. The wife is happy because we can eat again. I get to drink again. I'm happy. Salary bonus? Sure! I says. Experimental whats-its? Don't mind if I do. Should a seen it coming. On the bright side, I can bend things real good now. Metal, bones. anything. And the rats they throw me is tasty. I bet that science guy would be tasty, too. When I get out of here I'm gonna to tear off a little piece of him. Stupid science guy. What are the chances of a major downtown bomb-threat and a flesh eating mutant invasion occurring on the same day? Pretty good, apparently. The corporal's suit keeps him safe from flying debris, but the claws and teeth on those monsters rip right through it. Experience has taught him to put a little distance between himself and these flesh craving goons. As well as a pipe-bomb or three. When all that is left of your girl-friend are her partly-chewed legs, you have to wonder what sort of rave it had been. The wide variety of monster-things chasing you around in your skeletor costume make that pretty clear. While most people would wind up as a canape for said monsters, luckily some latent psychopathic streak seems to have kicked in when our boy Mike found that nice, shiny Katana. 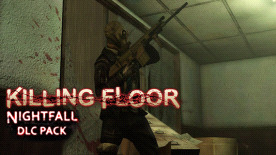 Killing Floor is required to play this DLC.